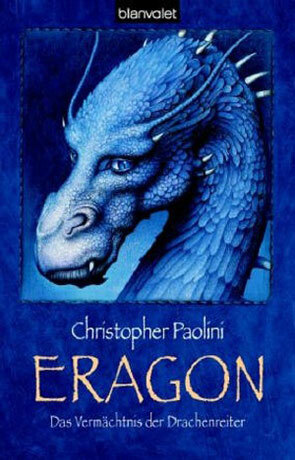 Eragon is the first volume in the Inheritance Cycle and has been written by Christopher Paolini. Eragon, a 15-year-old boy and lives with his uncle and cousin on a farm near a small village. While hunting in a large range of mountains nearby, Eragon is surprised to see a polished blue stone appear in a mystical flash in front of him. After trying and failing to sell or trade the stone, Eragon witnesses a baby dragon hatch from the "stone," which was in reality a dragon egg. As the dragon grows, Eragon find his life changing beyond his control and he is forced to flee his home when the evil King Galbatorix finds out about the Dragon Saphira and sends his henchmen to track them down, capture the dragon and kill Eragon. While hiding in the forest from these evil followers, his home farm is attacked and his guardian, Uncle Garrow is mortally wounded. After Garrow passes away, Eragon has no reason to stay in the village and so he set's off to seek vengeance, accompanied by an elderly story teller named Brom. Eragon has recieved much acclaim and a great deal of success, including the release of the Film by the same name. Christopher Paolini was only 15 when he began writing the novel and as such this story is quite an achievement. The story does however borrow quite heavily from established fantasy series like The Lord of the Rings, The Belgariad and works by Raymond E Feist and Anne MacCaffrey. Having said that, the quality is written to a high standard although the lack of experience by the author is quite telling in places. Ultimately there just isn't enough originality here to become anything like a classic, it is quite a nice story for all that though, worth a read just don't expect too much. Written on 10th October 2008 by Ant.